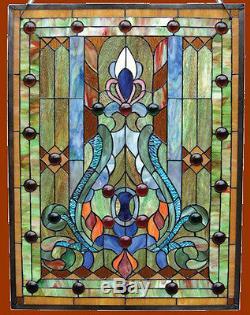 Hand-crafted Tiffany Style Victorian Design Stained Cut Glass Window Panel. Handcrafted with 280 pieces of cut stained glass and 30 Cabochon jewels. Each piece is copper wire wrapped by hand individually, then soldered together. The true Tiffany craftsmanship is reflected in this beautiful piece. 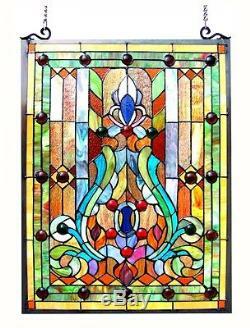 This window panel measures 18" wide x 25" tall. The first photo is of the panel when received out of the box. Second photo is what the panel will look like with light passing through it. You will love this window! All of my Stained Cut Glass Windows Come With Chains and Hooks For Easy Hanging. NEW ITEMS ARE ADDED EVERY DAY! PLEASE, do not send an item back without checking with us first because our items come from different locations. The item "Stained Glass & Cabochons Victorian Design Window Panel 18 x 25 Handcrafted" is in sale since Wednesday, March 27, 2019. This item is in the category "Antiques\Architectural & Garden\Stained Glass Windows".